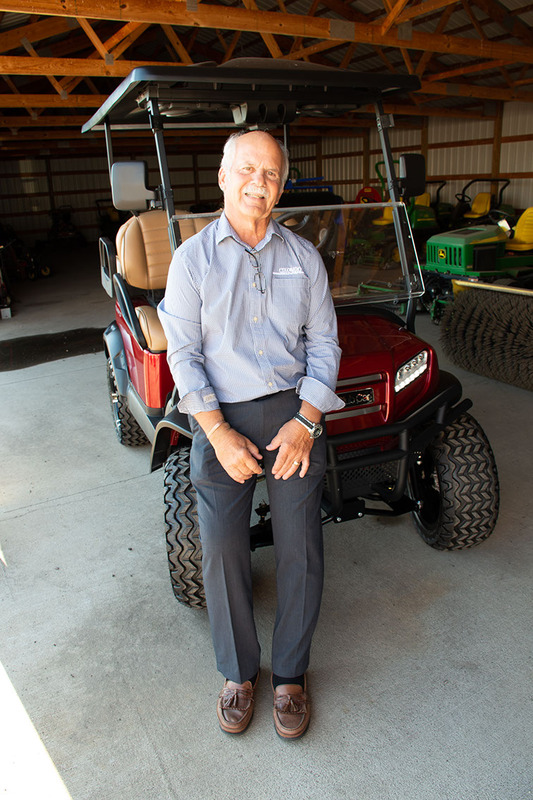 Tom Bauerle’s company, Colorado Golf & Turf, keeps the state’s courses moving. In 1983, Tom Bauerle, a Denver-area CPA with his own accounting firm, received a fateful phone call from his friend and “fellow golf nut” Ken Peden. He wasn’t the only who didn’t know. At the time, the vehicle synonymous with on-course transportation in Colorado was E-Z-GO. Club Car, then a 20-year-old company that a group of former E-Z-GO executives had purchased in 1978, had maybe 5 percent of the market share. Not long after getting the distributorship and naming it Colorado Golf & Turf, Bauerle bought out Peden and sold his accounting firm. Today Club Car’s Colorado market share is closer to 60 percent, and golfers in Colorado are starting to ask what an E-Z-GO is. 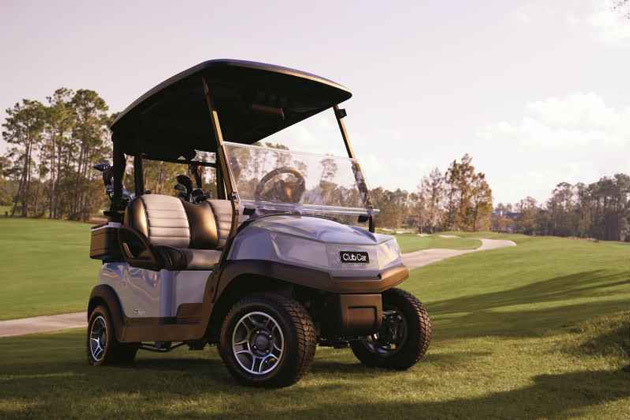 Owned since 1995 by global manufacturing giant Ingersoll-Rand and headquartered in Augusta, Ga., Club Car has continually innovated its golf-car line while expanding its offerings to include commercial utility vehicles (including rugged four-wheel-drive 4x4s) and personal-use transportation (the slick new Onward and Tempo models). Whatever Club Car comes up with, Colorado Golf & Turf will sell, lease, rent, finance, customize, accessorize, maintain, repair, refurbish and upgrade it to satisfy its customers. Tom Bauerle with a “lifted” Onward Club Car. “We step up and supply batteries and loaner golf cars to make sure the courses stay operational,” says Director of Sales Drew Hunter. 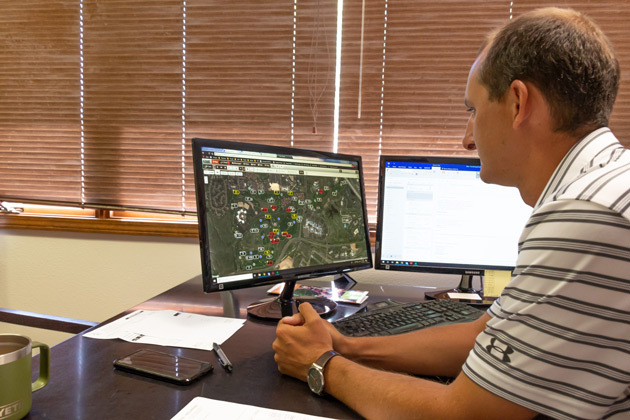 That dedication to going the extra mile permeates through Bauerle’s entire 30-member team and has won Colorado Golf & Turf lifelong customers throughout its territory (which includes Colorado and most of Wyoming). Bauerle also owns Nebraska Golf & Turf in Lincoln. “I’ve never had a discussion with him where he said, ‘I don’t think we can do that,’” says Jeff Seltz, Head PGA Professional at The Club at Rolling Hills in Golden. “He is aces in all regards, a man of sincerity and integrity,” says Scott Erwin, the PGA Director of Golf and Owner representative at Aspen’s Maroon Creek Club, where the fleet of black Club Cars gets outfitted with fine leather upholstery, Visage GPS, chrome wheels—all leased for one season of less than 10,000 rounds. CG&T doesn’t only serve private clubs. Jim Hajek at Fossil Trace, Bob Persichetti at Red Hawk Ridge, Jeff Boyer of Eagle Ranch and dozens of other PGA Professionals at Colorado public courses also share Tom Bauerle stories. One comes from Eric Feely, the PGA General Manager at The Bridges Golf & Country Club in Montrose, who praises Bauerle not only for helping maintain an aging fleet after the course was bought out of receivership in 2010, but also for the product and money he donated to the Owen Daniel Reak Dolphin House Golf Tournament, an event in which Feely has a deep personal connection. “And Tom’s a huge supporter of the PGA and the Western Chapter,” Feely notes. Bauerle was made an honorary member of the Colorado PGA Section and sits on the Colorado PGA REACH Board of Trustees. His company is a Gold partner of the Rocky Mountain Golf Course Superintendents Association. “Tom’s always understood the needs of the superintendent,” says Steve Datweyler, the Course Superintendent at The Club at Ravenna in Littleton. 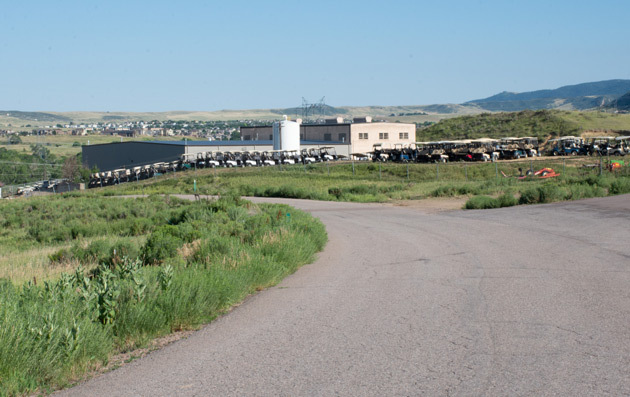 Ravenna’s gates lie just two miles from Colorado Golf & Turf’s nine-acre complex on the west side of South Wadsworth near Waterton Canyon. After relocating a couple of times, the company set up shop on this rolling parcel that can accommodate more than 1,000 golf cars (and, yes, according to the American National Standards Institute, they’re cars, not “carts,” because they are self-propelled). A small sampling of the multiple types of service and maintenance vehicles available at CG&T. 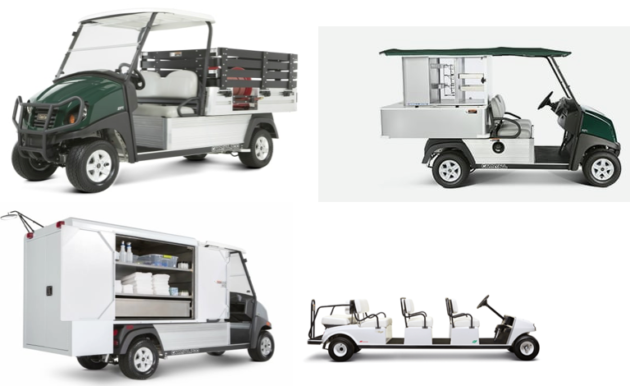 The cars share the lot with beverage cars, six-seaters, range pickers, Carryalls and other vehicles for tasks related and unrelated to golf, such as housekeeping, trash collection, maintenance and equipment haulage. A number of multiple-seat cars can be rented for events like weddings and dog shows. There’s also space devoted to the refurbished tractors, mowers, blowers, spreaders and other allied equipment needed for the turf portion of the operation. 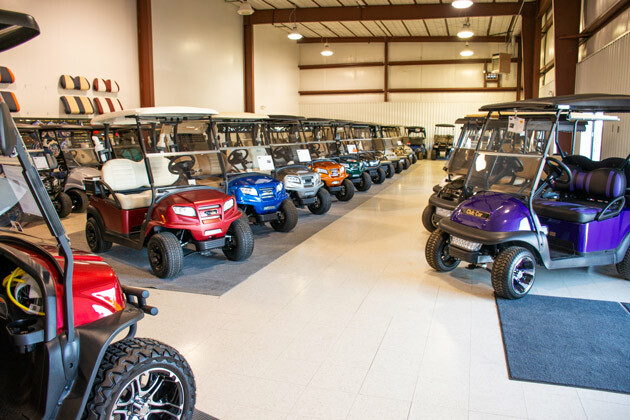 While Colorado Golf & Turf’s administrative offices occupy the modest two-story building near the road, a vastly larger, hangar-like structure houses a sales showroom gleaming with a variety of Club Car models in dozens of colors and configurations and featuring multiple accessories—from Visage GPS systems to fly-rod holders. Club Car’s Onward line in (from left) two-passenger, four-passenger and “lifted” models have become extremely popular for personal use. Since Colorado law allows use of vehicles on roads but rules vary by town or city, Bauerle’s staff gladly walks customers through the differences between an ordinary golf car (federally limited to 15 mph); a Personal Transportation Vehicle with minimal safety modifications for street use (20 mph max); and a “Low Speed Vehicle” (LSV), which is fully equipped with safety equipment and requires a federal Vehicle Identification Number (25 mph max). 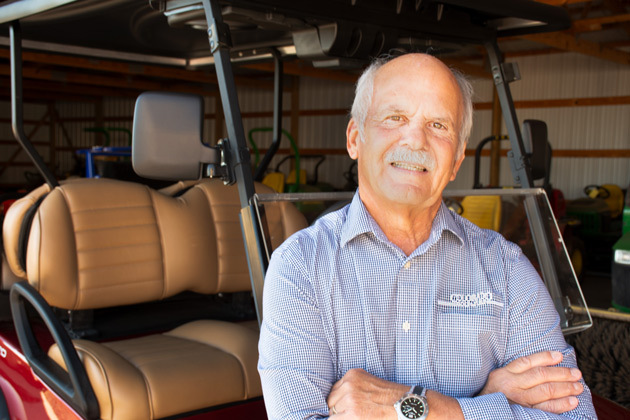 Along with private golf-car ownership, a concurrent trend Bauerle sees is more golfers seeking alternatives to golf cars. He cites as examples GolfBoards, Golf Bikes, Segways and Golf Scooters. Club Car’s new Tempo Walk comes with on-course GPS yardage, carries bags, coolers and other accessories, and allows you to walk without pulling or pushing a cart or lugging a bag. Club Car, too, has its new Tempo Walk, a stylish autonomous club caddie that offers golfers state-of- the-art wireless technology including GPS yardage and hands-free remote control. Author Jon Rizzi is the editor of Colorado AvidGolfer To learn more about Colorado Golf & Turf, visit cologolfandturf.net. PrevPreviousScottsdale Royalty: Can’t-Miss Deals at Fairmont Princess, The Boulders and MORE!